I'm in an anthropology class called "The Politics of Humanitarianism," and I've just toppled one of its reading assignments. I tried posting a 140 character review on Twitter, but it wasn't successful--someone asked me to try again. Since the professor too requires more than just a tweet in response, I wrote up a couple pages. I share those here for Neema and for the rest of you portal junkies who need a break. 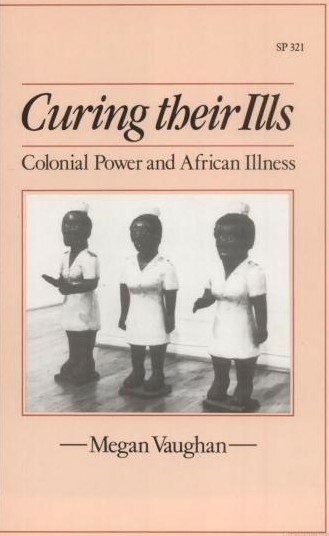 In Curing their Ills, Cambridge anthropologist Megan Vaughan examines the difficulties faced by African colonizers as they tried to find the best frame of reference from which to approach African medical problems. Colonizers struggled in their own debates to determine whether to perceive Africa and Africans in terms of difference as well as whether to attribute behaviors and outcomes to African culture or African nature. Vaughan conveys the idea of Jean Comaroff about biomedical knowledge that "whilst it is ostensibly based on 'empirical objectivity', in practice its underlying epistemology remains a 'cultural construct', existing in 'dialectical relationship with its wider social context'." Though the colonizers may have had good intentions, it is problematic to transplant a cultural construct. Vaughan explores "the African" as assumed by the medical community in the context of missionary medicine, leprosy, insanity, sexually transmitted disease, and didactic books and videos. A challenge with missionary medicine was how much the care providers should link physical health with spiritual health and "moral" practice. Perhaps no construct is as cultural as a religious one. An interesting aspect of dealing with African leprosy patients was that the colonizers seemed to view their primary identity as that of lepers and only their secondary identity as that of Africans. The problem with identifying insanity was that it was defined as an aberration from "normal" but normal African behaviors themselves were viewed as pathological by many colonizers. The growth (or at least persistence) of STDs was in part a result of the traditional African systems being destabilized by those introduced by European interaction, and some blamed it specifically on Christianity which hoped to introduce its own moral code in the place of the indigenous one. Regardless of the medical issue, the response would include propaganda of some sort, and this propaganda whether in the form of written material or film could not be created without first defining its audience and that audience's learning styles. One response I had to the book was that when seen through an anthropologist's critical eye, a cultural boundary-crosser can enter a no-win situation. How shall the traveler interact with his host culture? To deny difference is to deny the other, but to perceive difference is to wade into alligator infested waters. Is it oppressive to even categorize another? Are stereotypes, useful shorthand in themselves, always unacceptable because of their generality rather than precision? If one cannot escape every influence of one's culture in making a judgment, then can the judgment withstand the scrutiny of a deconstructing anthropologist? Yes, colonialism is a concept with terrible connotations, but not everything related to it is terrible. Individuals, groups, nations, and cultures have asymmetric relationships, and within any asymmetric relationship is found the potential for abuse and is often found colonialism either in fact or in creative perception. However, such asymmetries and abuses existed within pre-colonial societies as well (no footnote on this). A key factor magnifying the disgraces of traditional colonialism as seen in Curing their Ills is that when cultures encounter each other, especially when one has new technologies, then change occurs. Change is often painful (e.g. for the Africans whose health deteriorated as they migrated to work locations in response to the globalizing economy) but in other cases the change alleviates problems (e.g. when transportation became available for the migrants). Maybe I'm a bit defensive because I'm  white,  male,  involved in international humanitarian efforts,  religious, and  carrying a passport from the neocolonial power. In any case, this was a thought-provoking book, and I write my critique with a smile! Vaughan, Megan: Curing their Ills. Stanford University Press: Stanford CA; 1991: p 6. This page is a archive of recent entries in the School category.